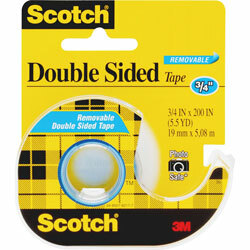 Scotch Double-Sided Tape is removable. This transparent tape is coated with removable adhesive on both sides. Sticks firmly, yet is easily removed and repositioned. Photo-safe tape is usable right off the roll with no messy liner to remove. Clear Tape from 3M! 159 In Stock today.